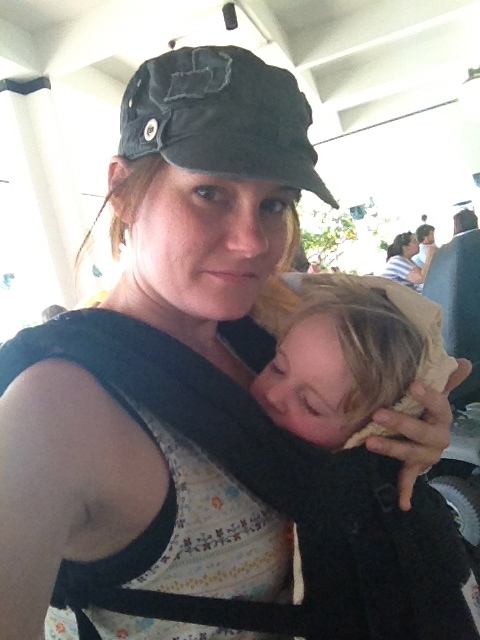 This week for Travel Tuesday, Megan at Semi-Charmed Kind of Life asked: Traveling with kids. How do you feel about it? If you're a parent, how do you decide what trips your kids get to go on? Well, look at that...right up my alley. Like I've mentioned before, Jeremy & I are both restless adventurers, and we're constantly trying to instill that in our boys. Our kids come with us everywhere. Like everything else in life when you become a parent, traveling becomes a family affair. I have often thought about taking a cruise or beach getaway with just Jeremy, but honestly, I think I would feel really bad and it just wouldn't be the same. I'll have plenty of time for that later. For now, while I still can, I want to show my children the world. There's nowhere that says kids have to be a burden when traveling. Okay, yes, they sometimes cry on airplanes, need frequent potty breaks, need constant entertainment and room to explode like little bottle rockets, but really, once you get over that stuff, traveling with kids can be better than traveling without! The beach is our #1 family destination. Kids do require a lot of attention and equipment for a day at the beach but I don't consider them a burden at all. Open spaces, birds to chase, other kids to play with, water for swimming, sand for building and you're allowed to get as dirty as you want. What's not to like? If you've never heard of Geocaching, its basically GPS treasure hunting where the hunt is the treasure. Leave the stroller at home, invest in a nice backpack carrier, throw him on and go! Kids won't appreciate the majesty of a mountain range, but they will eat up those wide open spaces. Kids are just happiest and more pleasant when there is nothing between them and the sky. Kids are never too young to learn what this world has to offer. We have been taking Jonathan to castles, monuments, museums, concerts, and more since he was a newborn. Kids don't normally notice much outside their tiny little worlds, so exposing them to pieces of the big world will only widen their perspective. When we travel, the journey is the destination (forgive the cheesy slogan). People ask, why don't you just fly? And honestly, we save money driving, but not always that much. We drive because we would rather sit comfortably in our own car, exploring the cities and states we pass through and take 3 days to get there, rather than fight lines at the airport, pay baggage fees, sit in compact smelly seats and get there in one miserable day. The key to successful road trips is to RELAX. -This is the carrier I have for Jude. I have used it since he was 4 months. It's perfect for quick trips and long days. It is the easiest to put on, most comfortable for both of us, and is the safest position for children's growing hips & back. I wore it with him in it for 2 full days of amusement parks and felt virtually no pain. So much more convenient than a stroller, if you ask me. -To make the most of your outdoor picnics/beach trips, consider investing in a 10x10 canopy. You can usually find one at Target/Walmart for around $100. Having shade for the little ones is important to extend your time outside. -Know you're kids' limitations & don't set yourself up for a disaster. Most 3 year olds won't walk quietly through an art museum, so save the headache and find a natural history museum instead. Dinosaurs are much cooler than Monet anyway. -Never pass up a learning opportunity. Kids are naturally curious creatures. A nature walk is practically a science class if you get creative...and dirty. -Plane trips and long car rides don't have to be your worst enemy. Forget trying to read your own book. Give your kids your full attention and stay positive. They will notice. And if that doesn't work, keep the portable DVD player handy. Find my Traveling with Toddlers tip here. I know people expect kids to be a pain in the A- when traveling, but honestly, they are probably so happy to be out of the house and in a new environment. They won't always be buckets of sunshine, but that's not what you'll remember. You'll look back through the pictures and remember the best parts most. You'll remember being together. So don't send them off to Grandma's...be a family of travelers. But it's worth noting...taking a couples getaway after you have kids is very important too...in fact, you should try to do it at least once every couple years. Jeremy and I were able to escape to Las Vegas for a weekend this past summer, and I'm so glad we did. Thanks again to Megan for the great Travel Tuesday prompt!! I love taking Noah places with us. He sees a lot that I don't see. I'm usually rushing to get from point A to point B and he makes me slow down. I love traveling with him. He can complain sometimes of course but for the most part he enjoys it.